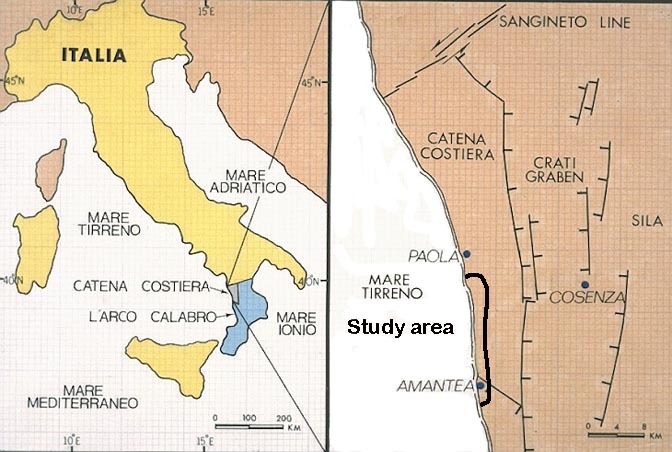 ABSTRACT - The geomorphology of the central Coastal Range, a north-south trending horst along the west coast of northern Calabria, is governed largely by major faults, fault scarps, and the distribution of principal rock types, as well as by various slope processes operative in a Mediterranean climate. Segments of the major rivers and streams have three principal orientations parallel to major faults in the study area: Northwest right-oblique slip faults (oldest); E-W oblique-slip faults; NE left-oblique slip faults; and north-south right oblique normal faults (youngest), all of which cut pre-Tertiary metamorphic rocks, Mesozoic limestone, Miocene molasse and calcarenite. The type of rock exposed at the surface depends on the pattern of separation of the stratigraphic succession across east-west faults (Fig. 1). Figure 1. Basement rocks in the study area represent a stack of nappes consisting of Late Paleozoic and Mesozoic metamorphic rocks emplaced in mid-Miocene time (upper diagram) and displaced by east-west striking faults (lower diagram). The nappe sequence is overlain non-comformably by Neogene sedimentary rocks. The two diagrammatic cross sections are parallel to the N-S coastline. The youngest, least metamorphosed, and structurally weakest rocks are at the base of the sequence. 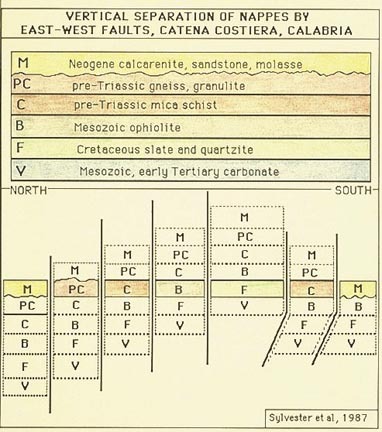 The colored bar in the lower diagram indicates those parts of the sequence that are presently exposed along the seacoast flank of the Catena Costiera. Small, underfit alluvial fans, composed chiefly of locally derived debris flow detritus, are present at the mouths of large, west-flowing canyons, some of which reach eastward to the crest of the mountain range. Not only do the north-south normal faults displace rocks and structure of all orientations, but they also make steep scarps in the small alluvial fans and in sediments of the coastal plain. Recent debris flow deposits locally bury some of the fault scarps. Incipient young rivers utilized the weaknesses along the major faults and cracks as avenues of erosion. Smaller streams and gullies generally flowed westward or down flank of the north-trending horst and thereby incised deep, V-shaped canyons; some of which have captured older SW-flowing canyons. Locally they were guided in other directions where they encountered faults or tectonic fractures (Fig. 2). Figure 2. 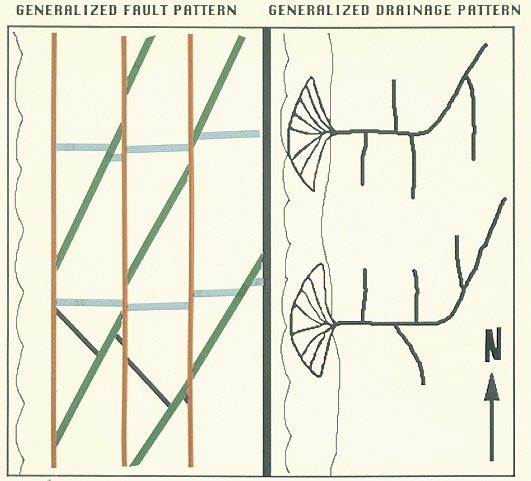 Schematic fault and drainage patterns. The sinuous lines on the left-hand sides of each diagram represent the coast line. Relative age of faults: black (oldest), blue, green, orange (youngest). The rocks present varied resistance to erosion, depending on the degree of cementation by groundwater salts, on the orientation of the foliation, and on the rock types. Thus mica schist with a relatively flat foliation forms nearly vertical sea cliffs, but the sea cliffs have a gentler slope where the foliation is steep or dips toward the sea. Therefore, downslope movements are facilitated by seaward slip on foliation, schistosity, bedding, and fault surfaces, and they are especially evinced by large and deep pre-Holocene landslides (Sackung) in phyllite up to 2 km2. Other downslope processes include surface creep and soil slip, particularly in highly fractured phyllite and schist, block sliding and rock falls. These downslope movements are just one of several geologic hazards in the study area. Younger, slaty and phyllitic rocks are highly prone to landslides. Combinations of four sets of faults bringing rocks of variable resistance to the range front. When sea level was 100 m lower – now the major slides have stabilized with their toes buttressed by recent marine deposits.